* Contains no yeast, corn, wheat, soy, milk, egg, salt, sugar, preservatives or fragrance. Ashitaba, also known as Tomorrow’s leaf is a special type of Angelica plant that is indigenous to a small area called the Seven Islands of Izu in Japan. The population of these islands is known for their longevity. Ashitaba consists of a variety of vitamins, minerals, proteins and plant fiber. Ashitaba is rich in dietary fiber and may be effective in improving gastrointestinal condition through increased excretion of feces that contain high level of bile acids. Past researches have identified two different chalcones in Ashitaba: Xanthoangelol and 4-Hydroxyderricin. These factors that exhibit antiviral activity are only found in this particular strain of Angelica. It is also these active ingredients that give rise to Ashitaba’s use as a diuretic, laxative, analeptic and lactagogue. Another possible beneficial use of Ashitaba is the lowering of blood sugars in diabetic patients. 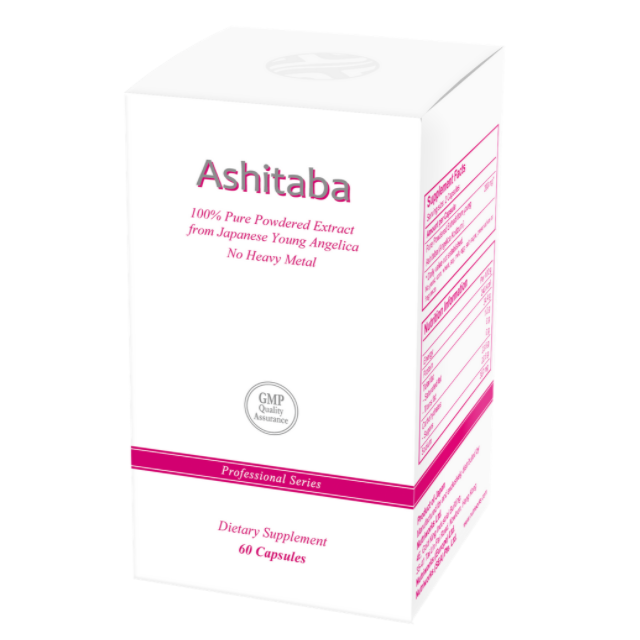 Ashitaba is a wonderful product for help with menstrual cramps, regardless of the patient’s age. Women who are going through their menopausal transition years may experience hormonal fluctuation, resulting in hot flashes, mood changes, insomnia, fatigue, memory problems, etc. Studies conducted on Ashitaba indicate that the use of this plant can relieve the symptoms.